Amsterdam is a city of water and there are many spots to go outdoor swimming in Amsterdam. In the North, the IJ-water behind Central Station is clean enough for a refreshing dive. Take a ferry to the North first and dive in. The Amstel river is also good open swimming water. And around the artificial island or IJburg, a large suburb east of the city, there are several artificial beaches to swim. The open water of recreational lakes Sloterplas in the West and Gaasperplas in Amsterdam South-East are also good for outdoor swimming. If you are really desperate for some feet dipping: try the ponds at Museum Square or in front of the Americain Hotel at Leidseplein. There are many children’s swimming pools in Amsterdam. The closest on in the centre is Vondelpark. The water is renewed every warm day. Many smaller playgrounds also have been equipped with water fountains. Most recent and fun fountain for kids to play is at Haarlemmerplein and the fountains at the Rijksmuseum garden (all free to enter). On the map below you’ll find places to go outdoor swimming in Amsterdam. Also added are children’s pools in Amsterdam’s parks: Vondelpark, Westerpark among others. Sloterplas is a recreational lake in the West of Amsterdam. From the center it’s only a 20 – 30 minutes bike ride. The lake is the result of the extraction of sand, used to uplift the Slotermeer area, an urban area created around the 1950s. (The lake is extremely deep!) Before that, Slotermeer (which literally means Sloter lake), was a lake, due to the digging out of turf by the Amsterdam folks. After pumping out the water, it became habitable. In the 1960’s the Slotermeer neighbourhood became home to many immigrant families from Morroco and Turkey. Nowadays, this area is also gentrifying. It’s got a big PLUS: the lovely Sloterplas and Sloterpark! The beach on the South-West side was recently expanded, creating a huge beach. The bar Hotel Buiten (not a hotel) is a good option to get some drinks, it has a sunny terrace along the water. You reach Sloterplas by tram 1 or tram 13. Gaasperplas is similar to Sloterplas, but it’s much further out, direction Southeast. The recreational facilities are much better though at Gaasperplas. Apart from a great beach, shops, toilet facilities and even life guards, Gaasperplas hosts a camping site, a sailing club and you can rent canoes and windsurfing. Gaasperplas is very easy to reach by metro. Sloterplas in the West has great outdoor swimming options. IJburg is a suburb built on an artificial island, easily reached by tram 26. In winter it can be windy and feel desolated, but in summer, when it’s hot, everyone wants to live here. The reason is its many beaches, suited for swimming, tanning and even beach parties. Hotspot is Blijburg, a wooden beach pavilion decorated with Buddhas, colourful cushions and other matching artefacts that make you feel like you’re have stepped on a beach in Goa, India, instead of one of the most boring suburbs of Amsterdam. At night, fires, candles and barbecues are lit while the dj turns up the volume. Spring, summer and fall, Blijburg organises parties and festivals. Definitely a great city beach in Amsterdam to pass a warm, moist and magical Amsterdam day or night. Swimming at the old industrial site of city beach Roest. Club Roest (‘rust’ in Dutch) Amsterdam is a large bar, club and city beach on Oostenburg, one of three so called Eastern Islands that held industrial shipyards, steamboat harbours and steam engine factories more than a century ago. In summer, the area holds a large sandy beach, a playground for grown-ups and children and lots of temporary festival-like events. Roest captures the industrial feel of the former shipyard. It’s located along the water and Roest has made sure the water is easily accessible for swimmers on hot days. For great outdoor swimming in Amsterdam, jump off the the spectacular leftover crane for the shipyard days. To get to Roest, take tram 10 or 26. At Westergasfabriek there is a large green field that fills up with barbecues and get to get-togethers of Amsterdam’s inhabitants. There is also a large paddling pool for children. If you want more quiet, walk up the pool, place yourself along the water and dip your feet in while you read a book. What a way to spend a hot summer’s day in Amsterdam. Can you swim in the canals in Amsterdam? Yes, you can swim in the Amsterdam canals. The Amsterdam canals used be an open sewer, but that was a long time ago. Nowadays, the water is so clean, the Amsterdam council is considering taking further steps to make the Amsterdam canals suitable for swimming. The problem is that there is a lot of garbage in the canals, especially bikes. Diving or stepping on bicycle parts can be painful. So I do not recommend it. Are people swimming in the Amsterdam canals? Yes, people swim in the Amsterdam canals. Every year since 1841, there is the Royal Amstel Swim. Participants swim underneath 6 historic bridges in the Amsterdam canals to promote clean water around the world. It’s in September, when the water is not so cold (but still cold!). People also drown in the Amsterdam canals, but that happens mostly when they piss in the canals while drunk. The IJ is the water north of Central Station. Take the ferry to NDSM and jump in at the city beach of PLLEK. Or take you bike on the ferry to the North and explore the route along the IJ -waters. From the different Islands (Java-island, KNSM-island and Zeeburg) you can easily jump in. The water of the IJ is fairly clean. Kids use the bridges to jump off, thought this is dangerous because of passing ships. Combine a bike ride to the architectural interesting islands with a swim. Always be careful with passing ships and shower after swimming. Check your body for bugs! The river Amstel river is not an official place to go swimming in Amsterdam. Just follow the river from the inner city and after about half an hour you are out of the city and you can jump into the lovely river. Be careful with diving in the Amstel river: the water near the edges might be shallow. All along the river there are people swimming and resting in the grasslands along the Amstel. Take a bike ride and jump in when you feel overheated! The Amsterdamse Bos is a large woodland park (we call this a ‘forest’). It’s the largest recreational area in Amsterdam, three times bigger than Central Park in NY and excellent for long walks and runs. Through it flows the Bosbaan, a waterway for rowing competitions. At the end you will find a museum dedicated the natural history of the park. Children will enjoy a visit to the goat farm and the pancake house. In summertime you can jump into the water. 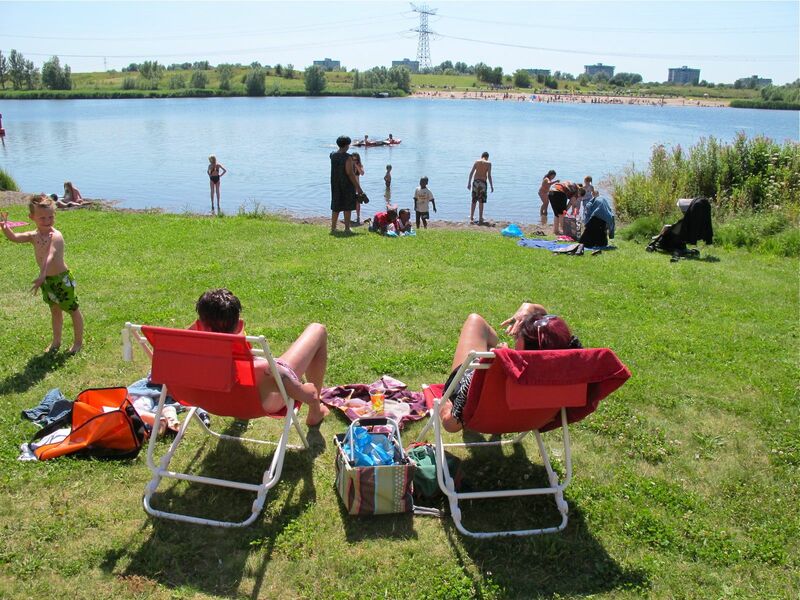 The Grote Vijver (Big pond) is perfect for swimming, especially for children. There are showers, toilets and a café. You can also rent canoes and water paddle bikes. When the sun sets, get out of there, because mosquitoes take over. De Nieuwe meer is a large lake in the middle of the Amsterdamse Bos. It’s popular for fishing and yachting. It’s big enough to find your own secluded swimming spot. Maybe you’ll spot a Highland cattle. Yes, you read it correctly. There are Highlands wandering around the area. And there is a gay cruising area as well. Don’t worry, there is nothing to fear from either. Just keep your distance! When there is a large warm period, what we call a ‘heat wave’ (hittegolf), the natural open water can get poisonous. Typically you’ll find a layer of ‘scum’, a thick dirty green and blue layer floating on top of the water. It’s also is quite smelly. The so called algal blooms or blue-green algae produce some toxic bacteria and is harmful for humans and animals. Swimming in affected waters can cause diarrhea, nausea, vomiting, poor eye sight, head aches and skin rashes. That is why the Dutch provincial authorities check the quality of the water of the recreational lakes every 2 weeks. If these bacteria are found (it’s called in Dutch blauwalg), signs are put up to warn the public. Be ware, that blue-green algae are also poisonous for dogs. Very informative ! enjoyed reading, Bedankt! You can read my mind! I’m just sitting in the Vondelpark, was looking at the brown water, thinking: Where in Amsterdam might the water be clear enough for a swim? Glad to be of help! Enjoy the swim! Thanks for the warning. The Dutch authorities are extremely careful and if it’s really not safe, swimming will be banned.